The burial of 26 Nigerian young women who died by the Mediterranean Sea - (Twitter Photo). Nigerians are angry, very angry at the moment. And this is because of the Nigerian government’s failure at taking the right action in an unfortunate incident that claimed the lives of 26 young Nigerian women. On the first week of November, news filtered in that 26 Nigerian young women have met their untimely end on their way to Italy through the Mediterranean Sea. 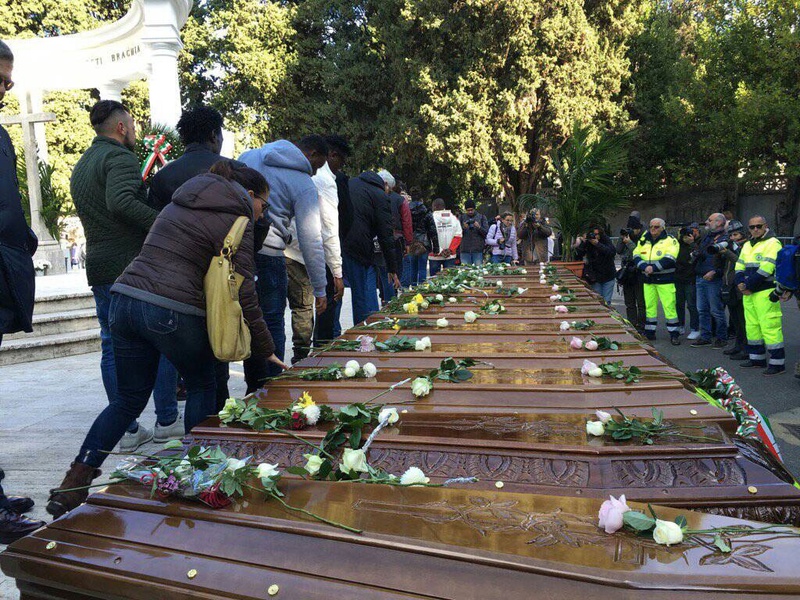 The Italian coast guard had rescued some of the girls as well as retrieved the bodies of the women, and on Friday had them buried in Italy without even a representative from the Nigerian government at their funeral. Instead, the Federal Executive Council, FEC held a meeting and set up a committee to investigate the incident. Unfortunately, Nigerians were rather shocked and outraged by the move that they had only invectives for the Senior Special Adviser to President Muhammad Buhari on foreign affairs and Diaspora, Abike Dabiri-Erewa who disclosed the government’s plan on twitter. May the souls of our girls who drowned at sea RIP. FEC has set up a panel to look holistically at the matter and report within a week,on drastic measures to be taken . Instead of pacifying Nigerians, the message backfired with some Nigerians saying the move was not only belated but showed how irresponsible the government is. “Madam please, in the name of God go and sleep. Are you people not tired of deceiving yourselves? What committee are you setting up? Committee to check if they actually died or if they were actually buried? Abeg comot for road, jare,” wrote another angry Nigerian, Omeoga Humphrey‏. “Idiocy & hypocrisy is when 26 of our citizens died in such an unfortunate circumstance and the Italian government was magnanimous to give them their last respect as humans but the Olodos we have as government didn't even deem it fit to send a representative even from embassy but are tweeting away,” chided Jude C. Ndukwe‏.